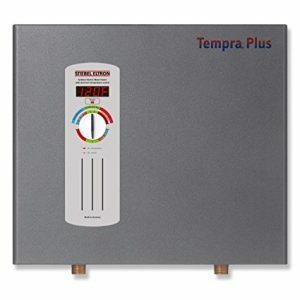 For a person like me – who considers “hating winters” as a hobby, the best tankless water heaters were a great discovery. They provide hot, searing water 24*7 while also keeping energy bills down. 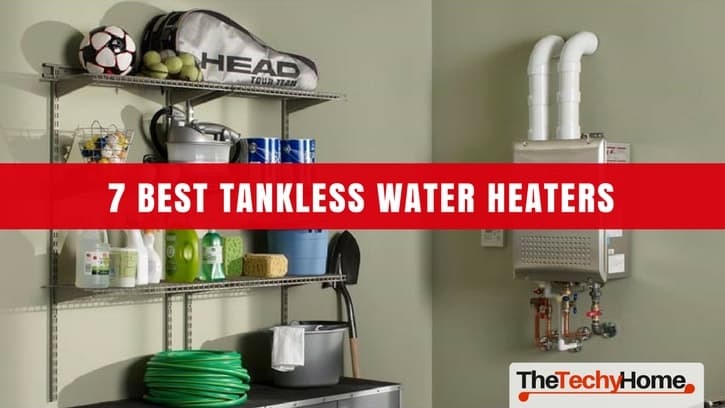 What’s more, since they are slimmer than their traditional counterparts, the best tankless hot water heaters require a modicum of storage space. Consequently, you don’t have to shuffle your whole house up and down to accommodate them. That said, while the best tankless water heaters are designed to make our lives easier, their search was very difficult. Have doubts? Think finding top rated tankless water heaters is a cinch? Do one thing: just visit your local market for the best tankless hot water heater. Once there, your mind will be puzzled by the variety of tankless water heater brands. To save you from a nerve wrecking expedition, we embarked on the journey to find the best tankless water heaters. And as the list mentioned below might tell, we ended up with not one, not two, but SEVEN top rated tankless water heaters. Being the successor of the Rheem RTE 13, the RTEX 13 had big boots to fill. However, despite the fact that it is relatively new, it’s already winning hearts with its user-friendly, reliable performance. The most praiseworthy feature of this heater, apart from its price, is its flow rate. A four GPM (Gallons Per Minute) flow rate means it allows you to run hot water on a shower as well as a low-rated kitchen tap at the same time. This impressive flow rate, however, shouldn’t suggest that this top rated tankless water heater isn’t compact. In fact, even if you live in a studio apartment, the 9 x 4 x 13’’ dimensions mean it won’t occupy much storage space. Apart from its compact size, another thing which makes this heater ideal for small houses is the source of its power supply. Yes, propane is cheaper than electricity, but you cannot use the former in confined spaces. Keeping this fact in mind, Rheem decided to provide this heater with an electric power source. It means you can use it wherever you like without worrying about things i.e. ventilation, gas pipes etc. After low price, most users demand devices which give them maximum control. The Rheem RTX 13, by allowing you to adjust its temperature with increments of 1*F, does just that. What’s more, there is also a thermostat located on its outside with an LED display, making it easier for you to set the temperature at desired level. If you have a large household or use two hot water showers simultaneously, the 4GPM flowrate provided by this heater isn’t enough. 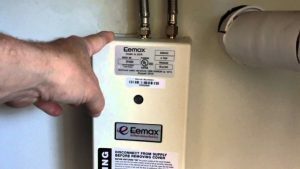 Of all the best tankless water heaters in this review, this one is undoubtedly the most inexpensive. It is a great choice if you live in a studio apartment and/or has a small household. You can order it here. Apart from my hatred towards winters, another reason why I turned to tankless water heaters is because of their low noise. However, as I later found out, not all tankless water heaters operate quietly. Luckily, the Stiebel Eltron Tempra Plus does operate in silence. Why is it quiet? This was the first question after I did the search. As I later found out, there were two reasons. First, this heater has high-grade electronic parts and a reliable cover, both of whom don’t vibrate. Second, it has NO mechanical switches. Both these facts combine to allow this heater do its work in silence. One major complain most users have with various tankless units is their inability to maintain the temperature on higher flowrates. In other words, their water temperature comes down the moment its output increases. This heater, thanks to its Advanced Flow Control technology, won’t do that. This technology forms the backbone of this heater, which means that no matter how much you experiment with the flow rate, the water temperature will remain constant. Also, while electric heaters can be installed anywhere, this unit, thanks to its extra-sleek design, is perfect for one or two room studio apartments. It means that if space is a luxury you don’t have, you need to get this heater. Finally, while the best tankless water heaters are already energy efficient, this heater has further upped the ante by its self-modulating technology. As implied by its name, this technology will modify the heater in such a manner by which its energy intake will remain constant. Despite giving a generous three-year limited warranty, Stiebel warns you that you have to hire its licensed personnel to install the product to keep the warranty valid. If you can afford to pay over the odds – both for the heater as well as the licensed personnel, I see no reason why this heater won’t suit you, regardless of your hot water demands. Order it here. The biggest problem most users have with Natural Gas Heaters is the nuisance of venting. To nip this evil in its bud, Rinnai has equipped the RUC98iN with two venting options: concentric-PVC and twin-pipe. You can select any one which you find easy to install and start getting hot water from the heater. If you live in a large house – or has a big family, you can take solace from the fact that this heater – without breaking a sweat, can supply searing hot waters to multiple faucets and showers simultaneously, with no interruption whatsoever. To put it quantitatively, this heater can provide hot water at a flow rate as high as 9.8GPM. This flow rate, in turn, stems from the natural gas intake which varies from 15,200 to 199,000BTU. That is, if you can afford to pump it its required gas, it will give you your desired water flow rate. Another concern which most users have with gas water heaters is their effects on the environment. People believe that these heaters pump astronomical amount of carbon into the atmosphere, thereby polluting it. However, this concern is sent packing by the 0.95efficiency rating achieved by this heater. In fact, look around, and you will be hard pressed to find a gas heater with an efficiency rating as high as this one. 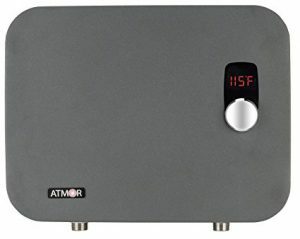 Judging from the tankless water heater reviews, users have two major problems with this heater. First, they complain that it is the bulkiest gas heater they have ever seen – a complaint which looks solid when you see the weight of this heater. Second, they believe that it is difficult to install. When it comes to water flow rate, even the majority of best tankless water heaters fade in front of this heater. So, if you believe you have such hot water demands, buy it here. 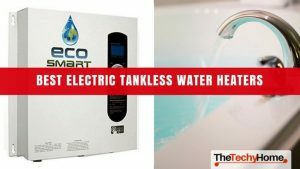 When I was going through this tankless water heater’s reviews, I found three reasons to include it on our list: it is compact, easy to operate and also provides a considerable flow rate for its price. Giving a lesson to other, high priced, best tankless water heaters, this one has a feature which most of them don’t: a water sensor. The moment you demand hot water, the sensor will start heating water for future usage. Subsequently, the moment you turn off the tap, the sensor will turn off the heating. Consequently, it brings down your energy bills to a negligible level. User-friendliness is the other feature adopted by this instant water heater. Though containing nothing fancy – it has only one knob underneath a digital thermostat, this device is a cinch to operate. In fact, even kids could operate this heater without any danger. After user-friendliness, safety is another badge worn by this heater. All of its internal components are IPS4 certified, which means they will remain dry and safe. Consequently, the chances of them malfunctioning to damage nearby elements are slim. Finally, despite its relatively low price tag, this heater has a feature which only the best tankless water heaters can boast of: a self-modulating system. This system delivers major energy savings, while delivering the recommended flowrate. Even for such a low price, users complained that the 3.7GPM flow rate provided by this heater is simply not enough. If you run two showers or multiple faucets at a time, this heater is simply not for you. However, if you are a bachelor living alone in an apartment – or a couple with only one washroom, this might just suit your needs. You can order it here. Talking about tankless water heater brands, the name of Ecosmart sits right there at the top of the pyramid. That said, it wasn’t the brand name which earned the ECO27 a place in this list. Rather, it was its features which forced us to coronate it as the best tankless water heater. All of us, when shopping for new products, look for the ones that provide the best value for money. 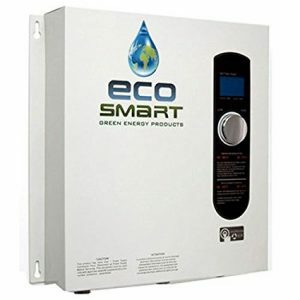 Having looked at the pros and cons of this tankless water heater, I’ve to say that it provides the best value for money. Even when the outside temperature is as low as 37*F, this heater stays true to its word by providing a flowrate of 3GPM. Provided the weather gets a little bit warmer, its flowrate will jump to as high as 6GPM. As a result, you can easily run two showers simultaneously on this heater. Moreover, its running cost is negligible. Using the trademark ECO 27 self-modulating technology, it makes sure the heater draws energy only when it needs it. This technology leads to increased energy savings and a high heater efficiency. To give you belief that it will last ages, Ecosmart has used Copper and Stainless steel components as the heater’s parts. Most people know that both these components don’t rust easily, a fact which is true. However, what most people don’t know is the conduction of both these substances. In other words, both copper and stainless steel have the ability to withstand high temperatures, while transmitting the heat from one end to the other. Consequently, while the heater is efficient on its own, both these components combine to make it durable. Ecosmart claim that they provide this heater with a lifetime warranty. However, most customers after firsthand experience came to know that the number of clauses in the warranty document is so complex that it is nearly impossible for anyone to claim warranty. If you don’t want a heater which is easy to install, operates brilliantly regardless of the climate and is easy to use, you need the Ecosmart ECO 27. Order it here. There are heaters which provide a decent water supply. Then there are those which provide a good water supply. Finally, there are those which provide a HUGE water supply. 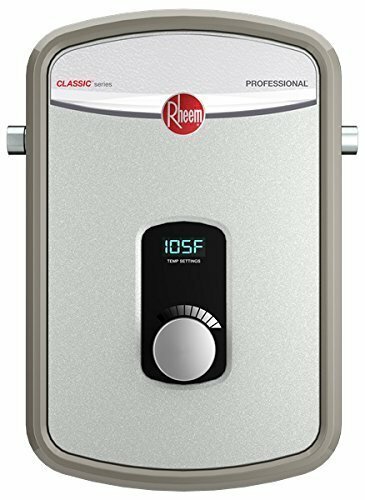 The Rheem RTGH-95DVLN belongs to the last category. As you know already, high water flow rate isn’t enough if the accompanying technologies cannot complement it. Put simply, a heater which, while delivering a good water flow rate, records temperature fluctuations, isn’t good. This heater, however, thanks to its stainless steel heat exchanger, isn’t one of those heaters. Rather, it gives you the option to connect both vents when the water demand is high. Consequently, you can draw maximum water without having to worry about the temperature fluctuations. You might ask: how does it do that? Well, say hello to its power consumption specifications. For, when running at full throttle, this unit consumes as much as 199BTUs. That doesn’t mean that it wastes a lot of energy. Rather, since it has a 94%energy rating, it will lower your energy bills while meeting your aggravated hot water needs. As for the heat output, this heater has been designed to handle temperature as low as -30*F. What’s more, Rheem it can operate at elevations as high as 9,800ft. Hence, if you are a mountain resident, this is the unit you need to have. Its high water output might fool you into believing that it is a commercial unit. However, it isn’t, and you might need to connect several of these for commercial usage. 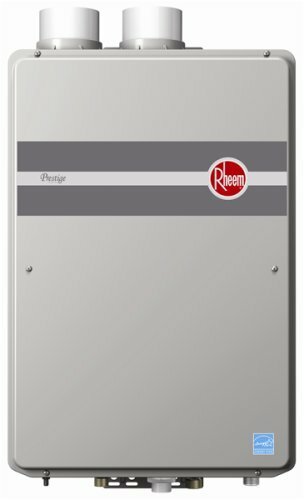 If you have very deep pockets – and want a heater for a lifetime of usage, your search should end with the Rheem RTGH-95DVLN. You can order it here. The compact is one word which seems synonymous to tankless water heaters. Still, if you want to see a heater which is compact to the bone, the Eccotemp FVI-12 is worthy of your attention. The Smallest Tankless Water Heater ! 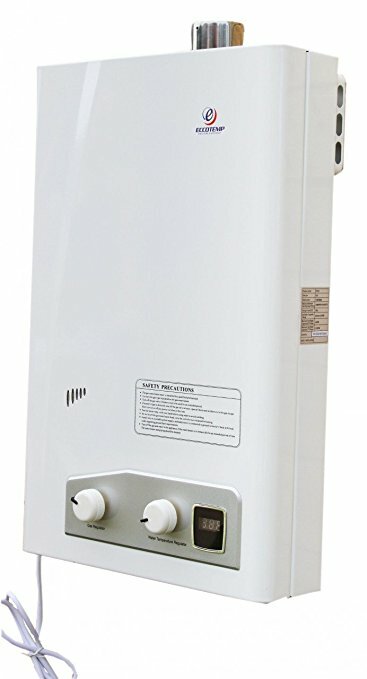 The most important – yet the most underrated feature, of this best tankless water heater, is its weight. 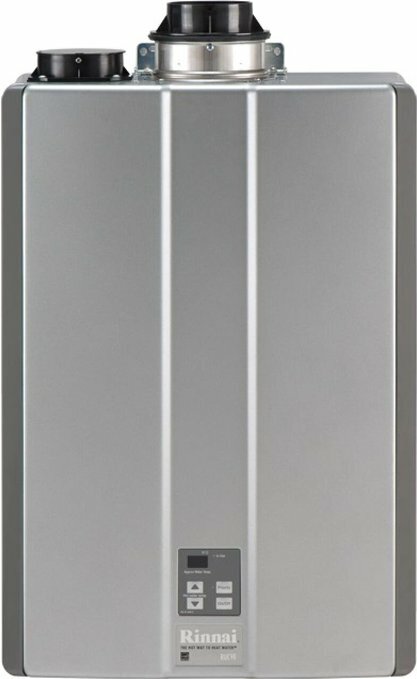 Yes, since it weighs only, holds your breath, 20lbs, this tankless unit is one of the most lightweight on the market. Its 2*15*24 dimensions also complement its weight meaning if you don’t have a large space to store water heaters, you need the Eccotem FVI-12. For its lean size, the FVI-12-LP’s maximum flowrate of 3.4GPM seems an anomaly. However, having tested the heater, I could testify that it can provide to one shower and one, low-rated faucet at the same time. Energy efficiency is yet another notable aspect of this heater. While it has a 20lb propane tank – and takes in 110W while running on full throttle, this heater draws only 2W while it is sitting idle. Consequently, it won’t amp up your energy bills while sitting idle. Finally, this heater is very easy to operate. On its front, there are two knobs: one for gas and the other for water temperature regulation. These are the only two mechanical switches you’d see on the heater. Alongside these knobs is an LCD screen displaying water temperature at any instance. What’s more, turn it around, and you’d see three pipe openings on the heater’s back: water inlet, hot water outlet, and gas inlet. More importantly, all three of them are labelled. Hence, if you want to install the heater without any help of a professional, it won’t give you a tough time. Although it has a small size, you still cannot use this heater in a confined space for its venting has to be ported outside. The compact is one word which seems synonymous to tankless water heaters. Still, if you want to see a heater which is compact to the bone, the Eccotemp FVI-12 is worthy of your attention.If you have a gallery or a front porch where you can install this small heater, you don’t have to worry about venting. Once you have done that, this heater will make your life easy. You can order it here. Searching for the best tankless water heater wasn’t easy. 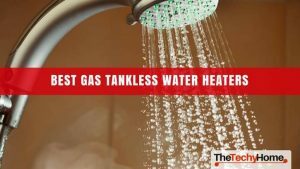 Apart from testing the pros and cons of various tankless water heaters, we had to look at various tankless heater brands. Luckily, as the above-mentioned products might suggest, our search proved to be fruitful. Now, it’s time for you to look at the specs and decide a heater which suits your needs. 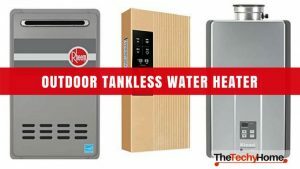 A Guide on the Best Tankless Water Heaters.